From the JHQ Dansk rare wood series. Wenge low serving or dresser top tray. Finely crafted rosewood and teak reversible serving tray by Jens Quistgaard for Dansk. 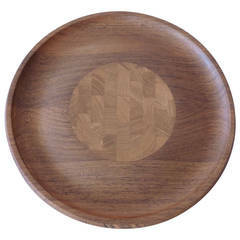 1960s midcentury teak tray by Jens Quistgaard JHQ for Dansk. 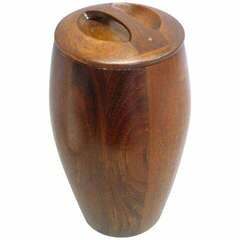 Massive staved teak ice bucket by Jens Quistgaard for Dansk, circa 1960s. The piece is in excellent vintage condition with a removable lid and an orange plastic liner. A great serving piece with all glass trays present this wonderful teak and glass serving set will be the accent of your table display!